An upright open shrub with lustrous dark green leaves with gray-green undersides. The semi-snowball shaped flowers are white and very fragrant. It is both heat and cold tolerant. It prefers an average, well-drained soil in full sun to part shade. Prune after flowering if needed. 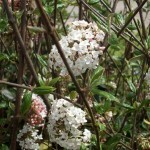 Use in shrub borders, foundation planting, or an informal hedge. It can be semi-evergreen in some climates.